When I was growing up on the Hawaiian island of Molokai in the early 1950’s, there were two pineapple plantations still going strong: Del Monte (California Packing Corporation) at Kualapu’u and Libby McNeill at Maunaloa – small isolated communities in the western hills of the island. World War II had recently ended. 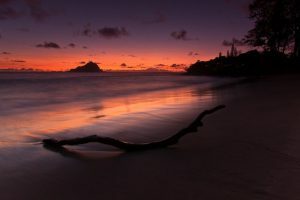 Hawaii was still a territory of the United States of America. The “plantation camps” – collections of aging, ticky-tacky worker housing – were owned by these corporations. The workers lived surrounded by the fields where they worked. The mindset among the people in that place was even smaller and more limited than “small-town” or even “village.” It was like growing up in a large extended family with all the same rivalries, alliances and hierarchies. Interactions between people in the camps were multi-layered and sometimes intense. Often there were insurmountable inequities. For many people life was hard. Despite it all, however, almost everybody agreed that life was good. ” ‘As how,” (that’s the way it is), they would tell each other when bad luck struck. It was a given that this neighbor would help and that one would turn away (or maybe even snicker.) The faults and flaws of individuals were recognized, acknowledged and mostly accepted. When everybody’s busy trying to make ends meet, little time can be spared for trying to improve how other people walk. “Enduring” what could not be changed in life, in others, and in yourself was a life-stance. People got along – or not – as best they could. Many of the people in the camp were from my grandparents’ generation. They remembered coming from places where life was much harsher. They had already made the Big Change: they had given up everything they knew to come to a foreign place where all the rules were different and “culture” became a thing they made up for themselves along with all the folks around them who were also mostly from other places. Life was “better.” Whatever challenges and obstacles they encountered in the camps were still “not bad” when compared to the trouble they had left behind. They knew the odds were good that the lives of their children and their grandchildren would be better than theirs had been in the old place. In all the hard there was time enough and space to laugh and sing, to notice and appreciate beauty, and to dream. There was room to cherish each other, to honor the ones who helped smooth the rough places and to forgive the ones who could not. I grew up in that mindset. Maybe that’s why I’ve always been fascinated (and confused) by the world according to people who write self-actualization and self-help books. In their worlds, any problem or challenge or obstacle can be and should be resolved. “Closure” can be achieved. All you have to do is build up your willpower and determination and attack the thing with all your might until it falls down in abject surrender to you, the Master Blaster. If you put enough effort into this exercise or that method or the other technique and pass on through every obstacle and challenge, then WHAMMO! you can win through to happiness and all good things. They assure you that it is imperative that you “fix” this issue or that one so you can find “closure” and then you can get ON with your life. Uh-huh…. I have slogged through acres of bookshelves full of those books. Finally there comes one that tells you that Life is really a LOT bigger than you. There are many problems you will never fix. There are many issues for which “closure” is impossible. And it only matters if you choose to believe that it does. 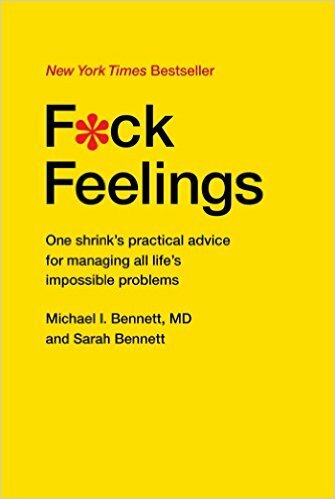 It seems to me that this witty and practical book, F*CK FEELINGS, can help you make useful and sustainable life choices that make sense to you. It was written with great warmth and humor by a Harvard-educated, medically trained practicing psychiatrist with over 40 years of clinical experience together with his daughter who spent years writing sketch comedy at the Upright Citizens Brigade Theater in New York. In the introduction, the authors say they aim at helping their readers accept that (a) life is hard, and (b) the reader’s frustrated efforts in trying to deal with assorted serious life problems are a valuable guide to identifying what cannot be changed. Once the reader has that one down, the authors detail sensible, positive and possibly effective suggestions for managing this stuff that can’t be changed. There are examples and scenarios of each of the major issues and explanations of how and why what you wish for probably won’t happen. There are reality-check moments and stories about how the more practical suggestions may play out (or glitch up). All of it is very down-to-earth and the commentary feels real. There’s also a bonus chapter about when and how to find appropriate medical treatment for a problem and how to decide when it’s time to stop. This book has been like a breath of fresh air to me. It is a good reminder that there’s no such thing as “fair,” that feelings are mostly stupid, and that life is hard on everybody. Still, as the authors point out, you can be relatively “okay,” no matter what, if your goals and how you reach for them are appropriate for the problem you are facing. The good doctor’s suggestions, more likely than not, have a good chance at helping you decide which moves are effective. He tells you that if you can manage to stay human despite your own inner demons, that is good enough. I thoroughly enjoyed the chance to read the thoughts of someone who apparently does not believe that he is God’s gift to the wretched. I think you will too. The excavation she is making of her ancestral past. And it’s made her face and body human-soft and warm. The heavy-hard no longer presses now. A wagon train of recrimination and regret. She’s even put up that brilliant sword she wields so handily. And takes off, into the endless sky. And it’s a glorious thing to see.